There are these two 10-11 year old girls in my neighborhood, who come to my shop very often to buy pens and other small stationery items. And they always have jokes to share with me. A lot of kids at my store are like that. Everything seems funny to them. When they run short of cash, that's something to laugh about. When that expensive pen they bought 2 days ago got "lost" at school and they got scolded at home for it, naturally that was one of the funniest things to happen to them. So was the time when they fell off their bike and scraped their elbow. (Oh yes! I get to hear "those" stories too! Little boys love to brag, don't you know?) One 12-year-old finds it most amusing when his mom threatens to lock him out of the house if he spent more than "X" amount of money in my shop that day! Kids don't take life as seriously as us adults. They simply find the humor in everything, jest their way out of any tricky situations, and win everybody's hearts with their innocent laughs. Nothing fazes them. They know, then, what we tend to forget somewhere between getting voting rights and becoming grandparents. Humor Improves Our Physical Health. A good, hearty laugh is good for the heart. No, really! It's a fact. Laughter exercises those muscles and blood vessels, and increases blood flow. It releases endorphins in our blood stream, that act as temporary analgesics and promote overall WELL-BEING. (Covered under 'W'.) It also reduces stress hormones in our body, and boosts our immune system. 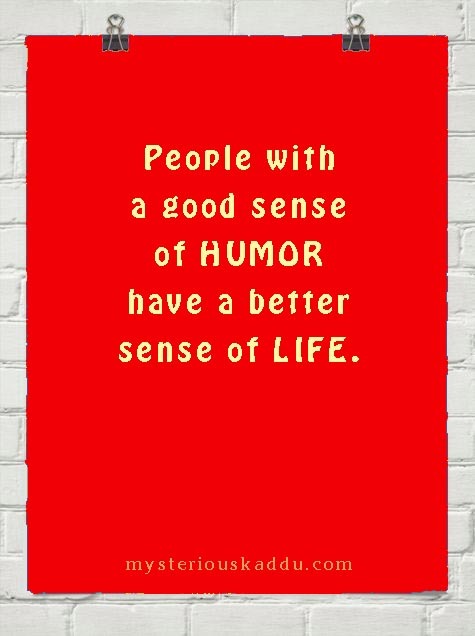 Humor Keeps Us More Positive. Remember Bruce Willis in the Die Hard series? Even in hostile enemy territory, he never stops making wisecracks and funny one-liners. Humor not only puts a stop to feelings of anxiety and anger, but also helps release stress and recharge our energy, leading to a state of CALMNESS. (Covered under 'C'.) It shifts our THOUGHTS (covered under 'T') and perspective from "I am doomed" to "Anything is possible". And, most importantly, it helps us get emotionally detached from our stressful situation, putting us in a state of mind from where we can find better solutions and ways out. Humans naturally gravitate towards jovial, optimistic people. We bond more easily with people whom we laugh with. Our jocular colleagues are the ones who are considered first for that promotion at work. Humor makes people forget their hurts, resentments, disagreements, and doubts. It helps us FORGIVE. (Covered under 'F'.) And nothing diffuses conflict faster than humor. Besides, remember Jim Carrey in that boardroom scene in Liar Liar? 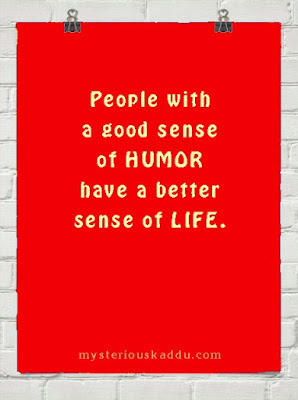 One of the best ways to develop our sense of humor is to stop taking ourselves so seriously. Everyone loves a person who can laugh at himself. So... do you have any such personal "goof-up" stories to share that could tickle my funny-bone? This is my tenth post for A to Z of Happiness. I have completed this challenge once before, and published it as a kindle ebook. You can get it on amazon: A to Z of Blogging: Take Your Blog To the Next Level. There is a lot of truth there that I need to apply to my blog once this challenge is over. My earlier years were filled with fun posts. I guess life got to me... barely 2 fun posts in the last 2 years... reflecting a sombre change in mindset, I fear. It was a morning rush hour for me and my son. For his short break tiffin I was packing some protein biscuits. In a hurry the tiffin box fell down from the kitchen platform and the biscuits were broken. I was feeling sorry for the loss. There came my son with a glue stick and said, "Can you stick them back?" This question eased the sadness in the air and we both had a hearty laugh! That's what is the best thing about kids and possibly the most important thing we can learn from them...life is too short to be taken so seriously. There's nothing that a little humour cannot solve! Very well written. So true but often forgotten. Thanks for the reminder! I agree wholeheartedly. Humour is the best way ever to keep your spirits up and also, sometimes, to coney a serious message. I've said this before and I'll say it again - I envy you your shop and your interactions with the young ones. More than anything I think one should take care of personal health, both physical and mental which can be possible only if you have some humor left behind. You have such a great time at your shop, don't you? I loved all the instances you mentioned here and that's the best part with the kids! They're innocent and funny and know their way out! Wow! You have some fun moments with kids at your shop. The other day I was watching a few kids play and I was amazed at the unbelievably funny stories that they were creating and having such a good laugh together. I couldnt help laugh with them and the smile on my lingered even when I was back home and cooking. I am a sucker for humour. I totally agree with you when you say that one should not take one's self too seriously. A person who laughs at himself is easy to get along with, anyday. You hit the nail on the head, humour is vital for survival. We should all embrace our inner child at least now and then. What a delightful post - I will remember this all day long. It's already made me smile. I'm not sure whether I have that sense of humor or not, but I whole heartedly agree with you, especially with inter-personal relationships. It sure does, Hilary! And I think we need all the laughs we can get, right?
" There's nothing that a little humour cannot solve!" Probably that's the time when we have fully moved on... when we are able to find humor in that situation. Right Debbie? Exactly, Sreesha! What's the fuss about! Share the link of your post na... would love to read it. That's an excellent point, Menaka. Having a little bit of humor does keep us healthier. Yes, that's the effect they have, Shilpa! Isn't it amazing! And to think that once upon a time, we were also like that! Oh yes! Totally agree with that, Vinodini! Me too, Raji! It is always so refreshing to be with someone who makes you laugh!